CD review: "A Night Before Christmas"
Generally dismissed by the snobbish jazz crowd as musical lightweights who play R&B that only sounds like jazz, Spyro Gyra's new Christmas CD sounds suspiciously like, well, real jazz. Pianist Tom Schuman has never sounded so solid, leader Jay Beckenstein's saxophone playing is restrained on most tracks, and the rhythm section of Scott Ambush (bass) and Bonny B (drums) sets down a solid jazz foundation. On readings of songs such as Vince Guaraldi's "Christmas Time Is Here" (from one of the "Peanuts" TV specials) and "Have Yourself a Merry Little Christmas," the band cooks like a straight-ahead jazz combo. When Manhattan Transfer's Janis Siegel duets with Bonn B on "Baby It's Cold Outside," the band steps it up another notch. 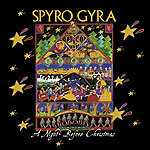 As jazz-themed Christmas discs go, Spyro Gyra's holds its own with more respected artists from the jazz world.